Desert Storm was designed by Johnny Gomez on the San Juan River in New Mexico around 1999. A subsequent article on the pattern appeared in Fly Fisherman magazine in 2001. Originally, the pattern used a single strand of Fluorescent Orange floss. However, Wapsi came out with an Ultra Thread UTC and became the preferred material as it lays down flat and is stronger than floss. UTC thread comes in three thicknesses, UTC 70 (70 denier) is similar to 8/0, UTC 140 is between 3/0 and 6/0. Note how you can get a greater segmentation by using a larger denier thread. Other multi-strand thread companies, such as Danville, produced a 210 denier thread that will work as well. Only three materials make up this pattern, the thread, a strand of Krystal Flash, and some Black Superfine Dubbing for the thorax. Earlier versions of Desert Storm used Peacock Herl for the thorax. A tag end of the thread is allowed to remain untrimmed along the length of the shank. 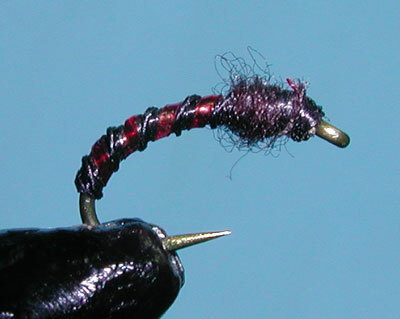 The thread is laid down as a evenly smooth body from behind the eye to the bend of the hook securing the Krystal Flash and the thread tag to the top of the hook shank. 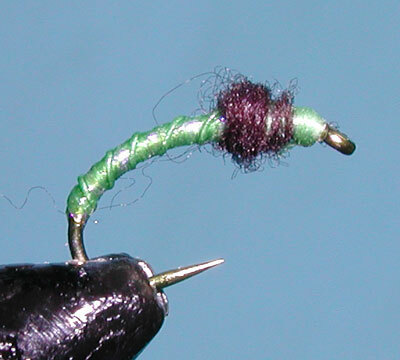 Then, the thread is wrapped forward to the thorax position, again with evenly flat wraps. Take the tag end of thread that extends from the bend of the hook and twist it in a clockwise direction. This creates a rope that you can wrap forward in evenly spaced spirols and secure with thread wraps at the thorax position. Wrap the Krystal Flash between the roped segments and also secure at the thorax position. 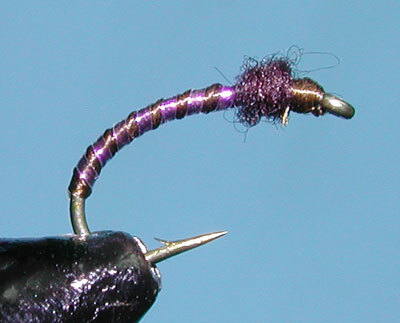 Dub the thread and create a thorax, finsihing with a whip finish in front of the thorax for a head. 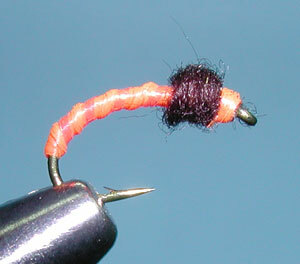 The Fluorescent Orange coloration is popular on the San Juan River for the blood worms that trout key upon there. We use the same colorations here within the Sierras on streams and lakes but with larger sizes of hooks in #14-18. 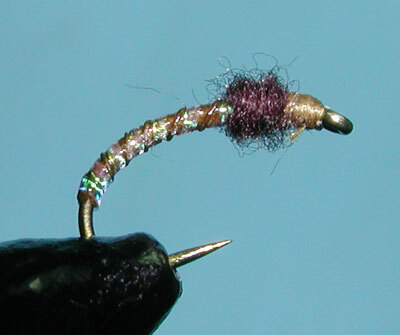 This pattern can be tied in other colorations too, imitating chironomids at different stages. You could use Blacks, Grays, Purples, or Reds. The roped thread ribbing gives an excellent representation of segmentation with the Krystal Flash providing a good attractor element to the pattern. Additional durability to the abdomen can be achieved by coating the body with an acrylic such as Sally's Hard as Nails or using Super Glue before dubbing the thorax..